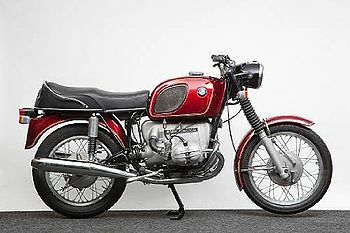 The R50 and R50/2 are 500 cc boxer twin BMW motorcycles that were manufactured from 1956 to 1969 in Munich, Germany, by the Bayerische Motoren Werke (BMW Aktiengesellschaft). In 1955 BMW created its R50, R60, and R69 models. The new models had a similar engine and the same shaft-drive as earlier models, but were fitted with modern swinging fork rear suspension for the first time. But it abandoned modern telescopic forks at the front in favor of the swinging or "Earles Fork" system. The chassis was painted in BMW's signature black scheme set off by white pin striping. The models had plenty of power to pull an optional BMW Spezial Steib sidecar. An interesting side note is that the BMW R25 was exactly one half of the engine in the BMW R50, using the same cylinder head etc. 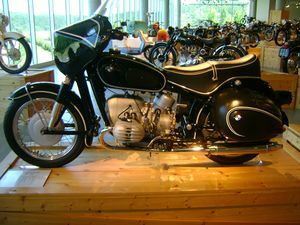 The BMW R50 produced 26 horsepower. The R50 was updated as the R50/2 in 1960 and joined by the sporting R69S. BMW has always built expensive motorcycles, but you got what you paid for. They have gained an enviable reputation for long-lasting reliability -even the quality of the black paint is wellknown! BMW set the standard for its day, and continues to build some of the most famous motorcycles in the world into the Nineties. This machine has period accessories, Wixom fairing and Enduro bags, both made in the USA. The long-awaited replacements for BMW's long-running Earles-forked flat twins finally arrived in 1969. As well as a telescopic, leading-axle front fork, the newcomers featured a lightweight, welded, duplex frame, innovations first seen on the Bavarian company's ISDT machines. The engine too had come in for revision, now employing a one-piece forged crankshaft and aluminium-alloy cylinder barrels while carrying its camshaft below the crank. Coil ignition and 12-volt electrics were other new departures for the Munich firm. The new '/5' models came in three engine capacities, the variation being achieved by different bore sizes in what were otherwise virtually identical machines. The R50/5 produced a claimed 32bhp, which was good enough for a top speed of 98mph. This page was last edited on 23 December 2018, at 05:24.